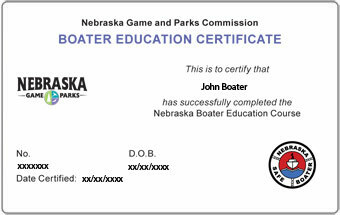 If your Nebraska Boater Education Card is lost or damaged, you can contact BOATERexam.com® to get a replacement card. Please note-we can only issue replacement cards if you took your Boating Safety Course at BOATERexam.com®. If you took your course elsewhere, please contact the Nebraska Game & Parks Commission at 1-402-471-5462 to order a replacement. The boater education card is proof that you have successfully completed a boating safety course. The boater education card does not expire and does not need to be renewed. Therefore, it is NOT a Nebraska Boating License!